The Walserhouse only satisfied the most basic living standards. The houses made of raw beams were covered with shingles which were weighed down with stones. The house measured about six metres in width, length and height. The splices were filled with moss and dung to protect against wind and cold. The house consisted of two rooms on top of each other. The basement acted as living room and kitchen and the first floor as bedroom. The bedroom could either be reached with a ladder or tenons that had been plugged into the beams on the outside. The little glassless windows (35x35 cm) created a dimmed light. The hens were held in the living room; they could get in and out through the so called chicken-hole. The cellar could be reached from outside. 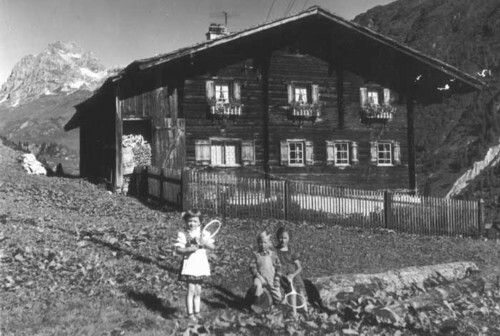 The older, still remaining Walser houses are from this time. They were no longer built with round timber but with hewed beams. From the bedrooms one could reach the little loft using a skylight. The lofts experienced a practical extension during this time: On the sides and on top little chambers were added. This extension is identifiable because of the “knitted” beams that do not fit with the building. For the larger part the house was extended on the backside. From the living room the “Vorhuus” (small pre-house) was directly reachable. 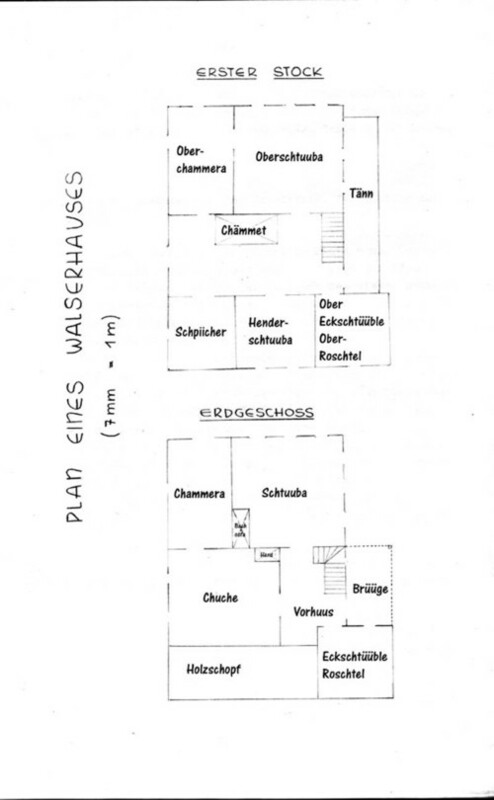 From here the kitchen and “Brüüge” (type of terrace) could be entered. The most backward extension is the wood shed. The two floors are connected with a stairs in the “Vorhuus”. The rooms in the first floor are: parlour, chamber, corridor, and three rooms the rear building. On the sunny long side of the house is a type of balcony, the “Tänn”. As glass became cheaper larger windows could be built and light sunbeams fill the prior dark rooms. A large stone oven that can be heated from the kitchen is standing in the living room. Sometimes, there is a small hole in the ceiling through which the upper living and bedrooms can be heated. The brown wood, the heavy, often coloured doors and chests as well as the low ceilings create a homey calm and cosiness. 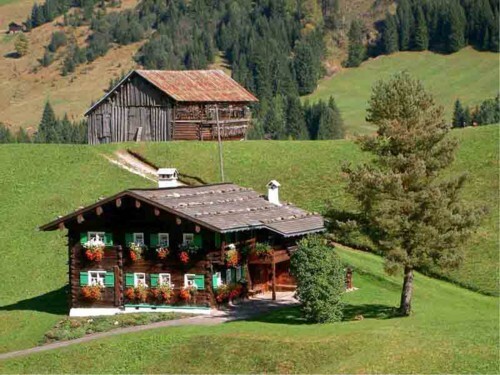 In Kleinwalsertal there are two diamond shaped holes in the corner where the crucifix is hanging. The are called “Glorialöchle”. The fill the room with dim light.